Most Stack Exchange sites offer a progress bar that displays how much reputation one needs to earn the next privilege. Would it be a good idea to display a progress bar for some of the badges as well? For example, for the "Pundit" badge, one needs to post 10 comments with a score of 5 or more. Why not add a progress bar that displays how many more comments are needed to earn this badge? Would this be a relatively expensive feature to implement? There are a number of other badges where such a feature seems useful. I believe this will add to the quality of the site. I would love to see more of these, but I'm sure they have their reasons to not add this for every badge - it's probably expensive to be calling the data for every user so much. My suggestion would be for that Badge Progress popup in the screenshot to replace completed badges with new badges that aren't earned yet, so you can always track the progress of new badges once you complete those three. Not the answer you're looking for? Browse other questions tagged discussion feature-request badges . Can we have a badge progress monitor on the badges page? Why isn't the Pundit Badge displayed on the Next Badge list? 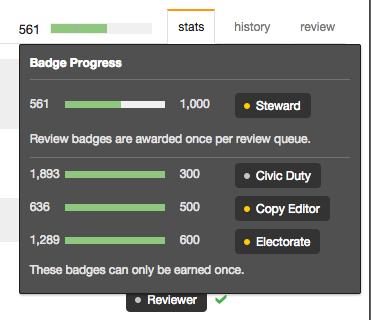 Is there a way to see my progress towards a specific “reviewer” badge? How to see your progression on the Pundit badge?